50% of all votes in the election (15million) went to losing candidates, while 74% of votes (22million) were 'wasted' - i.e. they didn't contribute to electing the winning MP. 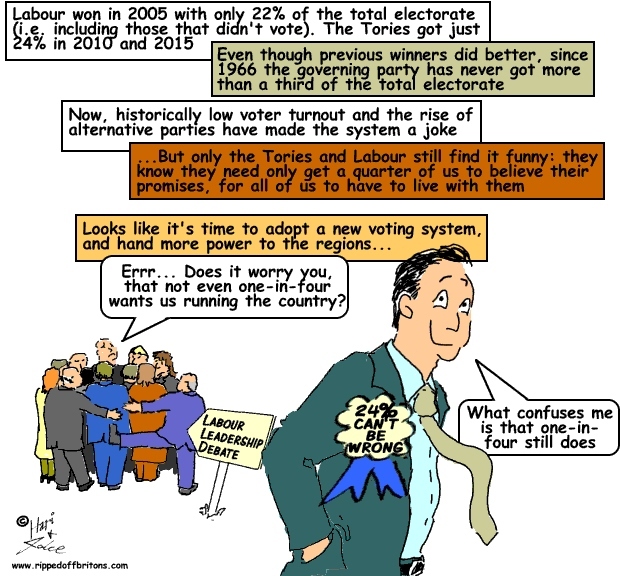 At the same time, 331 of our 650 MPs were elected on under 50% of the vote, and 191 with less than 30% of the electorate. An estimated 2.8million people voted 'tactically' this election for candidates they didn't fully support - nearly a tenth of all voters. Much of this 'lesser evil' approach comes from the fact that in some constituencies there are only one or two candidates who realistically stand a chance of winning. Many of these are 'safe seats'. The ERS was able to call the winner correctly in 363 of 368 seats - a month before polling day - due to the prevalence of these under First Past the Post. Now, we're no Mystic Megs - we just know the system is bust. The problem goes deeper than these statistics, though. First Past the Post is artificially exaggerating divides in the UK - giving the SNP nearly all Scottish seats on half of Scottish votes, while virtually excluding Labour from the South of England. Equally, Labour are over-represented in Wales, while the Conservatives are under-represented in the North of England and Scotland. It's a mess. The situation is just as bad in Northern Ireland. Cross-community parties there got a tenth of the vote on 7 May - but no seats. Yet the Democratic Unionist Party (DUP) received nearly half the seats on just a quarter of the vote.